When it comes to getting more greens into your diet, it means you need to be eating more salads, right? But I bet there’s been a time where you sat down with that big salad in front of you and you practically yawned because you were so bored with it. 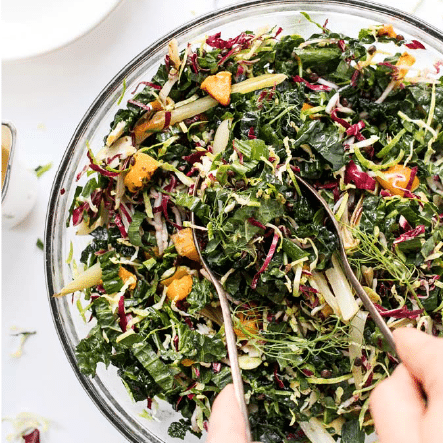 I’ve been there – bored to tears with my salads but really wanting to incorporate those dark leafy greens, that I know are good for me, into my daily routine. 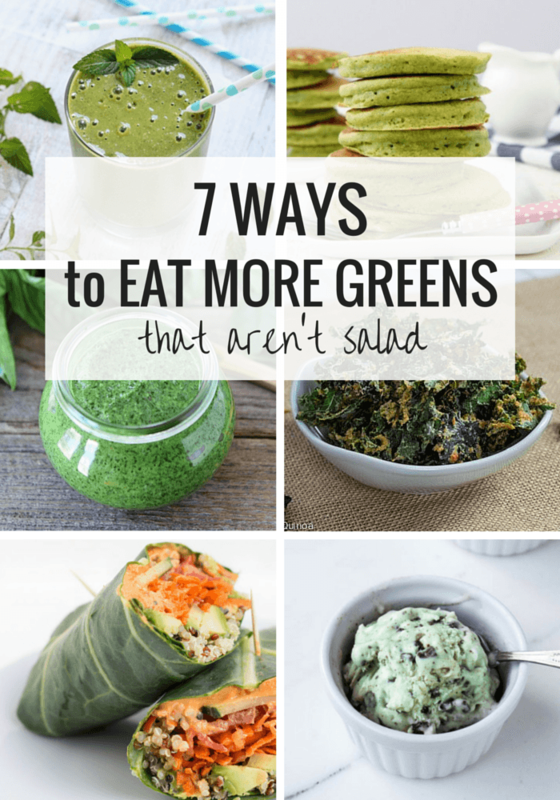 Today we’re going to toss the misconception that you need to be stuffing your face with salads out the window and see 7 fun ways to eat more greens (no salads in sight here!). Whether you’re new to the healthy lifestyle and just starting to incorporate more greens into your diet, you have kids that despise eating their veggies, or you already eat healthy and simply want to up your green intake, this post will help you do just that! 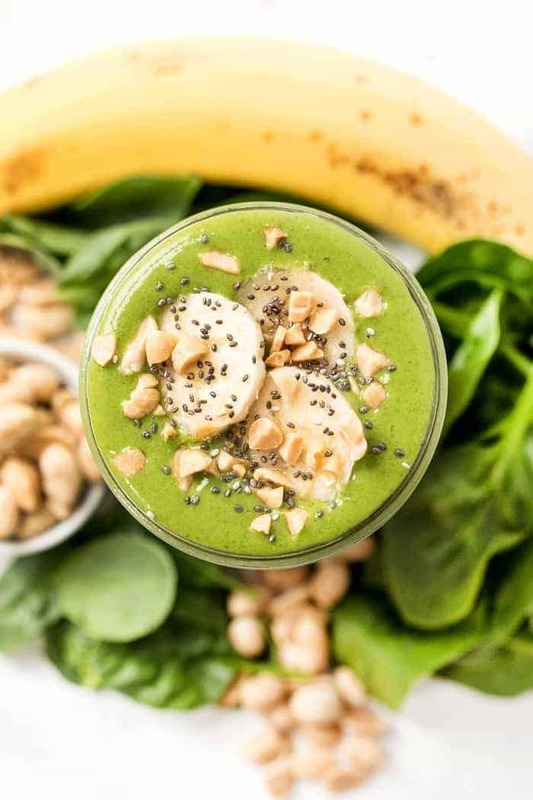 The green smoothie and juice craze has swept across the nation and while it might just sound like another passing trend, these nutrient-rich sips are actually insanely good for you. Personally, I drink at least one green beverage every day and I have seen tremendous changes in my health – increased energy, better digestion and a rock-solid immune system, just to name a few. Now if the concept of adding greens to your drinks is a little foreign, I suggest starting with smoothies and moving your way to juices. Making green smoothies couldn’t be easier. Start with just one handful of greens (preferably spinach). If you’ve never had a green smoothie before, use your favorite smoothie recipe and simply add just a handful of greens. My suggestion would be to start with spinach because it has a very mild flavor and work your way up to other greens like kale, chard, collards, etc. Use fresh herbs. Adding fresh herbs to your smoothies can be a great way to brighten up the flavor while also giving you more nutrients. I like to add herbs like mint or basil, but you can certainly use others like cilantro, parsley, etc. Don’t be afraid of the color. It’s okay if your smoothie isn’t vibrantly green. In fact, many times it probably won’t be, especially if you’re mixing in berries. And if your smoothie turns a muddy brown, that’s okay – I promise it will still taste delicious! Once you’ve gotten super comfortable with green smoothies, then I think you should try the juice. You can make juice in your blender (follow this method) or you can pick up your own juicer and juice at home. 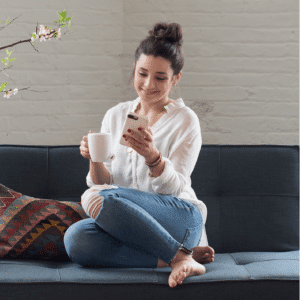 I like the blender method for beginners because juicers can be expensive and I think a high-powered blender (my favorite is the Blendtec) is a much more versatile machine and a smarter investment. This is a super stealthy way to eat more greens without changing the flavor or texture of what you’re making. 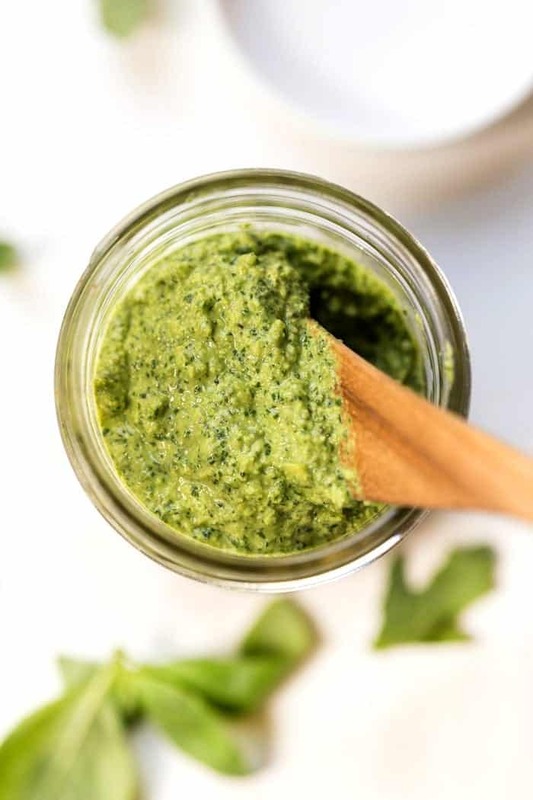 Pesto, which is traditionally made with just basil, still tastes just as delicious if you throw a handful of spinach or kale in there. 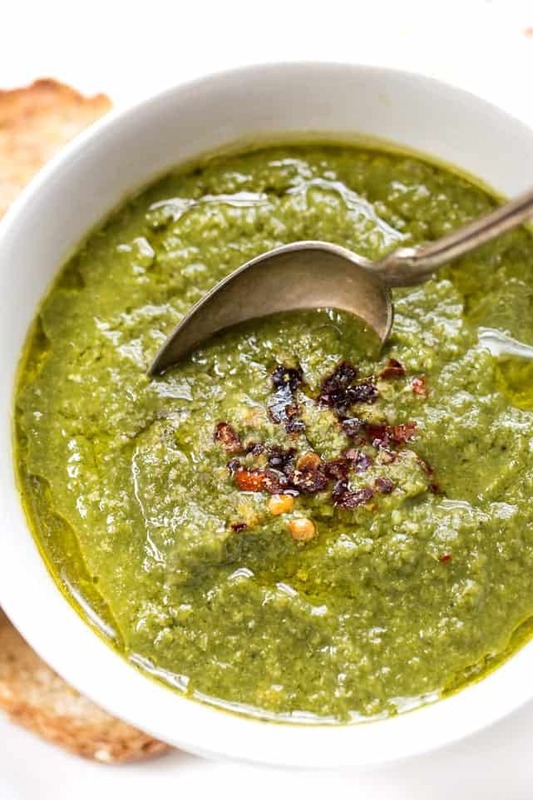 In fact, there are hundreds of recipes out there for pure kale (or spinach) pesto. Kids will dig and you can use pesto on pretty much everything which is awesome. For the pastas, if you’re making a red sauce based dish, just stir in a bit of finely chopped greens into the sauce before you pour it over your pasta. If you’re making a Primavera or something with a bit more veggies, just add some greens to the mix. Not only will the dish become more vibrant, but you’ll also be adding lots of great nutrients into the meal! There are lots of breakfast foods that you can easily add some greens too without changing the meal itself. Lover of a good scramble in the morning? Simply toss in a cup or two of chopped greens. How about muffins? Try adding some spinach to your next batch. 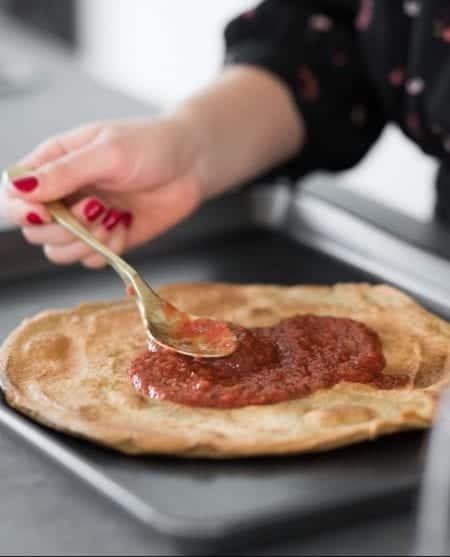 Or even pancakes? While it might seem crazy to eat green pancakes, I promise you won’t even notice it! These comfort meals are great place to sneak in some extra veggies. Not only can you puree most greens and turn them into a luscious soup, but you can add chopped greens to dishes like minestrone, chilis, curries and even something as basic as chicken noodle! Because the greens (and again, especially spinach) have such a mild flavor, they really won’t have any impact on the dish at all. It will be the same old dish you love, just a little bit healthier! Love potato and tortilla chips? Yeah, me too. But what I don’t love is that these snacks a) have zero nutrition so you aren’t ever truly satisfied, b) are typically made with refined oils and fats, and c) a serving size is like 10 (and let’s be real…whoever just eats 10? <– not me!). Instead of reaching for those chips, make a big batch of kale chips! They’re super easy to make, have that salty and satisfying crunch that regular chips do but are like 1,000X healthier. Other ways you can add greens to your snacks is by making things like hummus, guacamole and crackers at home. Next time you make a batch of hummus, just add some greens to it. Or guacamole? Stir in some finely chopped kale. And if you’re a cracker lover, sure to try these Cheesy Kale Quinoa Crackers. This might be one of my absolute favorite ways to sneak more greens into my day. 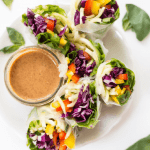 You see, I’m a serious sandwich lover – always have been – but since going gluten-free, I’ve started to rely more heavily on wraps to get my sandwich fix. But still, gluten-free wraps are not only expensive but sometimes they’re more carbs then I feel like eating at lunch. My solution? Collard wraps! 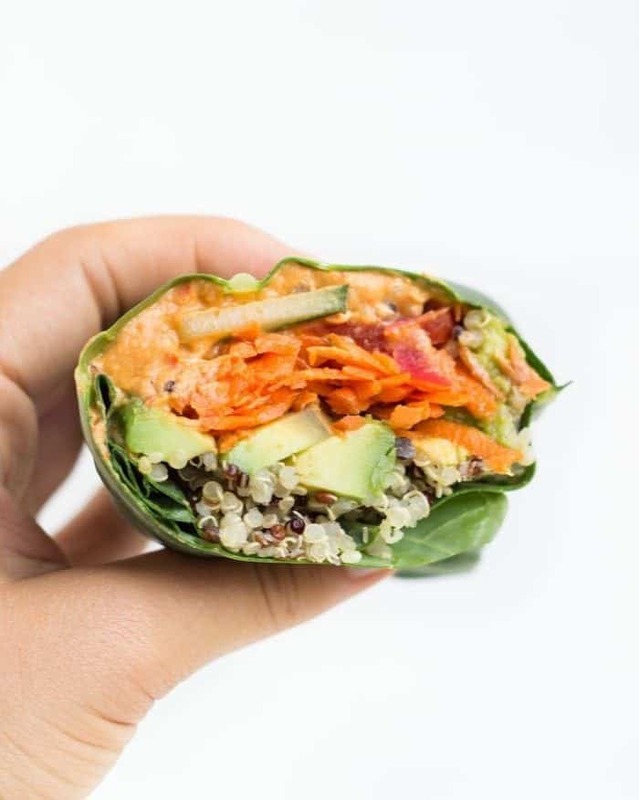 More specifically these Quinoa + Veggie Collard Wraps (<– major yum). Essentially you just take the collard leaf, trim the stem off and then make your wrap just as you would have with a traditional flour wrap. Add your fillings, fold in the sides, wrap it up and you’ve got lunch. AND bonus, you’re getting a boatload more nutrients than you would have with the alternative. Classic flavors like mint chip and pistachio often use food coloring to get that vibrant green color. But here’s the thing, food coloring really isn’t necessary. Instead, trying adding spinach to the ice cream base – it will give you the color, won’t change the flavor AND it will be good for you! Okay, okay. I know. Brownies with greens? Don’t knock it until you try it, my friend. These brownies, in particular, are delicious and you would NEVER know there was kale inside. They’re fudgy, chocolatey and oh so tasty. Do you have any tips for adding more greens into your diet? Let me know in the comments below! Do you have a recipe for the brownies mentioned? Where is the brownie recipe? It’s not coming up for me. WE add Spinich to Spagetti, usually just under the pasta , and then when the gravy is added and mixed you have a good meal. I also use green beans or zucchini sometimes. I also use the greens from the top of celery to make Pesto. Yummy good. The smoothie idea is a good one. Myself, I don’t like savory smoothies. I like fruit smoothies, so I put the greens in those. I’m up to two leaves of kale, which is a nice balance between sweet and the earthy undertone the kale adds. Cukes and mint are great in smoothies, too. I add greens to all kinds of sauces. I know you are gluten free, but, for example, when we are eating pasta, I mince kale and throw it in the sauce about 2 minutes before serving. Stir-fry? All the standard chopped and diced veggies per usual, plus 1/2 cup kale or similar. Pad thai? Oh yeah! Plenty of basil. Get your kids eating Asian and Indian foods from an early age. They are usually veg heavy and lots of green stuff–there are other such cuisines, but these are readily available all over the place. Think saag!!! Next is a great trick for the kids; I like it myself. We have one child that loves veggies, one that doesn’t. Both love eggs. Both are Seuss fans. So, scrambled eggs are now green eggs, but using greens, not food coloring. Into the blender: 1-2 eggs per person, 1/2 clove of fresh garlic, small handful of diced onions, large grabful of spinach for each 3 people eating. If you’re feeling adventurous and are omnivores, you can even throw in a slice of ham for Seussical authenticity–but NOT necessary for great taste. Anyways, puree. Yes, puree. Until nearly smooth and runny-frothy. Pour into a hot, greased (or non-stick) pan. Cook like scrambled eggs, but be careful moving eggs around in the pan: this stuff is airier and more liquid (from moisture in the spinach) and will fly out of the pan if stirred / flipped too aggressively. Cooked consistency is between normal scrambled and soufflé. I’ve added grated Asiago and / or ketchup for the youngest and hot sauce for the eldest. They clean their plates every time. If you cook too many eggs, just refrigerate and nuke it later for an after school snack. I didn’t know you could eat collard greens raw like that. They definitely are sturdy enough to work as a wrap! Yes! I love using avocado in baked goods – I really need to do more of it. Do you have a favorite recipe? I’d love to see it! I know, right!? That ice cream…to die for! Great suggestions! I love greens in my smoothies and definitely want to try collard wraps. Collard wraps are amazing! I just made one yesterday that i HAVE to share on the blog. It has a nori sheet inside and it’s so, so good!